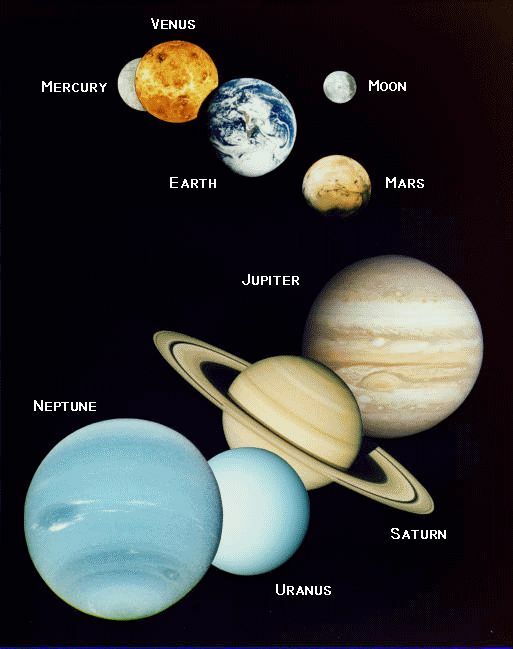 The words “planet” and “star” are used in a slightly different sense in astrology than in astronomy. For example, Sun (a star) and Moon (a satellite of earth) are called planets in astrology, along with Mars etc. Basically, a graha or a planet is a body that has considerable influence on the living beings on earth. Distant stars have negligible influence on us, but Sun, Moon and planets in the solar system have a great influence on our activities. So the word graha (or planet) is used to describe them. Seven planets are considered in Indian astrology. They are – Sun, Moon, Mars, Mercury, Jupiter, Venus and Saturn. In addition, two “chaayaa grahas” (shadow planets) are considered in Indian astrology – Rahu and Ketu. These are also called “the north node” and “the south node” respectively (or the head and tail of dragon). Rahu and Ketu are not real planets; they are just some mathematical points. Apart from these 9 planets, there are 11 moving mathematical points known as Upagrahas (sub-planets or satellites). We also have lagna (ascendant), which is the point that rises on the eastern horizon as the earth rotates around itself. In addition, we have some mathematical points known as “special ascendants". Externally, Surya signifies those people or relationships in our life that are strongly related to royalty, power and the identity of the society. These are presidents, leaders, and directors. Since the Sun is at the center of the solar system, controlling the orbit of all the other grahas, it governs people with power or authority. On a smaller scale, this could be a governor, mayor, and in the family environment, the father. Surya represents those buildings that reflect power and dignity, such as temples, mansions and palaces. Physically, Surya rules the aspects of the body that are most dominant in terms of control (the brain), the maintenance of life (heart) and maintaining the shape (bones). Surya rules the right eye. Internally, Surya represents our tendency, ability or talent to act as a leader or authority. Qualities signified by Surya: are aristocratic, dominant, authoritative, leading, fatherly, strong. Surya relates to square shapes. Surya represents the element of fire, as well as the many ways fire can expressed in other qualities. In the scheme of colors, the bright red is signified. In the spectrum of taste, the pungent taste is the hottest. Out of the three substances, Dhatu ("metals", any lifeless substances), Moola ("root", and plant form) and Jeeva ("life", any animal or human form), Surya relates to Moola. Determining what objects are signified by Surya: Of any living being or thing, whatever part of it controls the rest, such as a control board, is related to Surya. In social structures, that is the leader. Within a computer, that would be the cpu. In a car, the combination of steering wheel and pedals. Among objects that belong to a similar group, such as varieties of trees, the Sun would represent the ones that are particularly strong or dominant. Externally, Chandra represents highly placed people having a nurturing role, such as queens and first ladies. Whereas Surya gets its importance from being at the heart of the solar system, Chandra gets is from being closest to the Earth, and from our subjective perspective on Earth, being at the heart of the solar system. Surya gets it's power from mere gravitational pull, but Chandra gets it from being close. Therefore, Chandra represents powerful people that play a more subjective role, nurture or are simply close to us like a mother. The light of the Moon is the reflection of the Sun, most visible in the absence of the Sun. Therefore, Chandra represents people that pass on the inspiration and spirit of the leaders, but in a supportive and gentle way. Physically, the systems of the body that nurture and feed the body are represented by Chandra. The blood distributes nutrition and oxygen to all parts of the body. In a female, the womb nurtures the child. Whereas the brain is represented by Surya because of it's controlling function, the hormones that are produced by the brain are represented by Chandra. Of the two eyes, the left eye is represented by Chandra. Internally, Chandra signifies our mindset and emotions, our response to sensory experiences, our imagination, our ability to care and support others, nurturing skills, empathy. Qualities signified by Chandra: motherly, caring, nurturing, emotional, sensitive, empathetic, imaginative, social, thoughtful, gentle, childlike charm. Determining what objects are signified by Chandra: Of any living being or thing, the part that is supporting or nurturing the rest of it is signified by Chandra. In a social environment that is whoever takes the initiative first to care of the weak or helpless: mothers, nurses, health care workers and social workers. The warrior planet Mars, or Kartika, is called the 'auspicious one' in Sanskrit and has a little-known spiritual side. In Vedic Astrology, the planet's house & sign position reveal how you express power & energy in love and in life. Mars means action, and it is the only planetary symbol that means action, ie needing to be occupied all the time. So Mars will take the initiative in love, seeking passion and excitement from relationships. Mars can be loving, nurturing and defensive against the negative world, or can destroy relationships with anger, jealousy and possessiveness. Born to war, Mars can play the role of defender or attacker. Mars is the commander-in-chief of the planetary war council. He is not afraid of his enemies and can challenge and set upon them. Fearless, powerful, strong and courageous, Mars has physical stamina and the capacity to achieve his goals. Martian energy is assertive, projectile, active and separating: its function is to differentiate the individual from the group. How a person appears outwardly, how aggressive he appears to the world, or how he seeks what he wants, depends on placement of Mars in the Birth Chart. A strong Mars in your chart could make you seem self-assured and confident, - a weak or challenging Mars could make you appear arrogant or indecisive, cowardly or weak. A strong Mars allows you to control your temper and use it constructively, - a bad placement of Mars suggests you may be quick-tempered, or may bottle up anger inside, seething and doing nothing. A strong Mars in a birthchart suggests someone action-oriented, single-minded, & who needs to guard against being too domineering. If you have a strong Mars, you will set boundaries and only allow people to deal with you on your terms.